Who doesn’t love hibachi? I know I do, especially the fried rice. I’ve been cooking fried rice since I was 10 years old. It was my “specialty.” No idea how it came to be or why I was so obsessed with it. 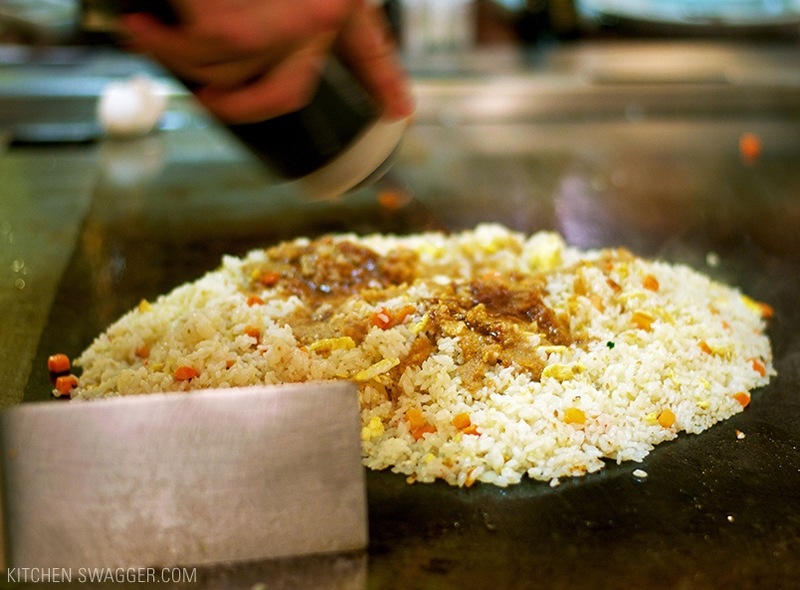 Hibachi-style fried rice is a lot simpler than you may think. A very wise man once told me (Japanese steak house hibachi chef) that all you need is soy sauce and butter. He called it “peanut butter” because you slightly melt the butter and mix in the soy sauce during prep. And yes, it actually does look like peanut butter. I make my fried rice just like the pros. I wish I could say the below image is my own hibachi grill that I keep in my living room but it’s not. However a wok is the next best thing (I highly recommend you pick one up). A wok can be used for a lot of asian cuisine. 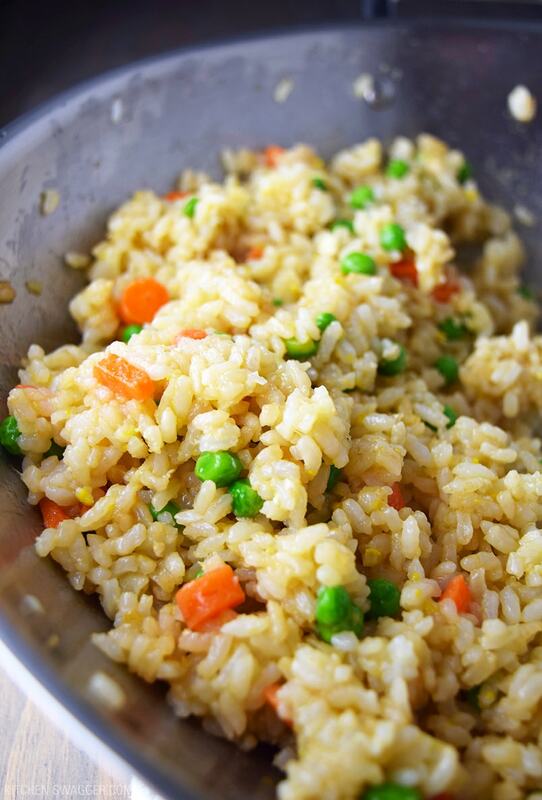 For this recipe I use canola oil, butter, less sodium soy sauce, white onion, peas, carrots, and one fried egg. It’s lighter, lower in sodium, and healthier than your typical takeout. 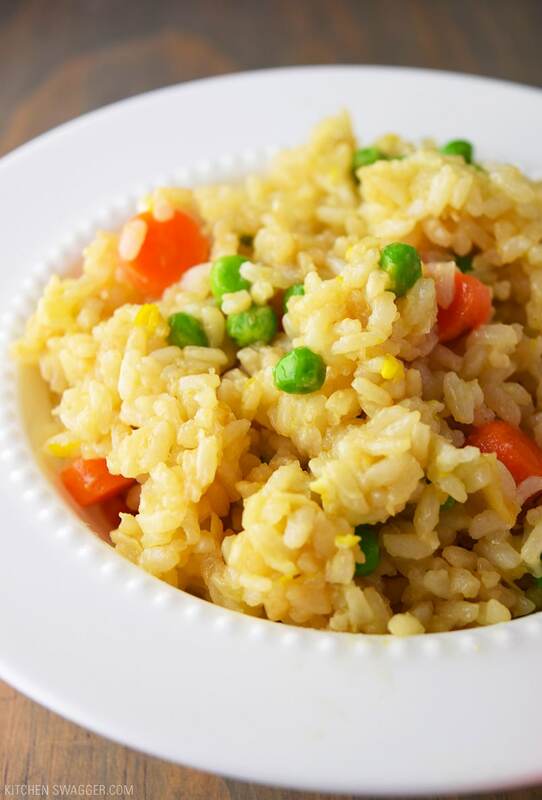 If you have leftover white rice in the fridge this is the perfect way to get rid of it for a killer side dish. Throw everything in a wok and cook on high heat for 5-7 minutes. It’s that easy. Prepare white rice using instructions on packaging, let cool and set aside. Meanwhile, chop all vegetables into finely chopped pieces. To make the “peanut butter sauce,” place butter in microwave for 10-15 seconds to soften, stir in soy sauce and garlic powder until mixed. Set aside. 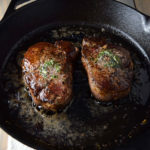 In a large skillet or wok, bring oil to medium-high heat. Fry one egg until no longer runny and break into small pieces using the tip of a spatula. Add vegetables to the wok and cook for 2-3 minutes. Add rice and stir in “peanut butter” sauce until well mixed. Cook for an additional 5-7 minutes. Serve immediately. I’ve found fully cooled or day-old rice works best. It doesn’t clump together when frying. Step 6 says add “peanut butter”. It’s not listed under the ingredients. How much should be added? Is it code for some secret ingredient? Good call Nita. I should clarify in the directions. The “peanut butter” is the soy sauce combined with the butter. I mix the two together before hand (creating a sauce) then add to the rice when frying. Thanks for pointing this out – I see how it could be confusing! Okay So I tried this last night and it was great! Thanks for sharing I will be using this again! Thanks Dennis – it’s so simple, yet delicious. 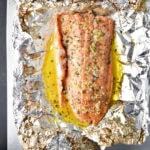 Thank you so much for this recipe my son is going to be one happy camper tonight I’m going to make this for dinner with some stir fry chicken! 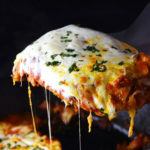 This is a very easy recipe – great for young kids and weeknight family dinner, and a great base off of which to add. I like that rice cooking time = chopping time. I added a bunch of things for flavor and to make it stand on its own as a hearty meal. Here’s what I added: poached chicken thighs cut into bite sized pieces (2 thighs), 1/3rd of a small fresh pineapple chopped, fresh chopped ginger, fresh chopped scallions, an extra egg, honey, Worcestershire sauce, a bit of sesame oil and extra soy sauce. I also left ~20% of my rice in the pot as I thought the sauce was about right for a slightly smaller portion of rice than 2 cups pre-cooked. Finally, I added sriracha to individual bowls (not the entire dish because of the young kids) and sprinkled with toasted sesame seeds. Wow, sounds great Laila. We usually pair with chicken. Great as a side or part of a dish! This would go great with a slightly sweet Vietnamese style chicken breast pre marinated with fish sauce. Great recipe been cooking Chinese food for a long time I will have to say this is a very delicious and easy recipe thanks for sharing it MistOne. To make this dairy free, do you think I could substitute earth balance for the butter? I love this recipe, I don’t eat rice so I substituted the rice with Inca Red Quinoa. It was delicous. I’ve been looking for a good Japanese rice recipe. You can’t tell the difference at all. Thank you for sharing. Everyone loved this dish even with Quinoa. Perfect! Glad to hear quinoa is a good substitute. Will have to give that a try some time. I LOVEEEEDDD THIS! Thanks guys! 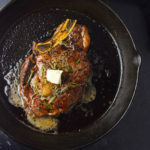 Could you make this on a stovetop griddle if you don’t have a wok? The recipe sounds delicious! I can’t wait to give it a try! Thank you for posting. Absolutely! Any pan should work. We made this for the first time last week, and it turned out FANTASTIC. I usually only tolerate fried rice that’s made at home because it’s always lacking, but I actually went back for seconds on this one. We’re making it again tonight to go with some teriyaki grilled shrimp. The “peanut butter” sauce really must do something magical, because the ingredients aren’t any different from other recipes we’ve tried, but this was so much better! The only things I did differently than your original design were to add in an additional egg (because I’m pregnant and need as much protein as I can get) and used frozen peas and carrots (because ain’t nobody got time to chop those things). 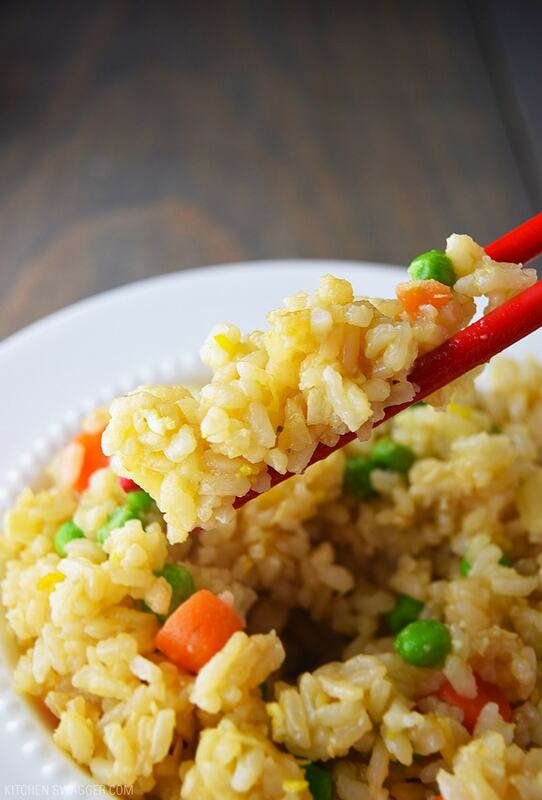 Thanks for sharing such a great recipe; I expect it to become a staple at our house anytime Asian cuisine is on the menu! Is it 2 cups of rice pre cooked or cooked? Peanut butter sauce has no peanut butter in it!? Is it peanut butter instead of butter or both? How much peanut butter? Is it ok to use brown rice instead of white rice? Or will it not be as sticky to be able to eat with chopsticks? Skeptical at first but decided to try this recipe anyway. Man, was I pleasantly surprised with the outcome. My normally picky eaters absolutely loved it, asked for seconds, and tried to get thirds! I paired it with smoked pineapple chicken breasts and spinach. Absolutely delicious! OMG!! !awesome recipe and easy to make, taste better than some of the Japanese chains around here. Thank you so much fo sharing this. Is there a chance you have a good one for the white sauce? Hmm what do you mean by white sauce? Melt butter and mix all ingredients. I would put the rice vinegar down to 1.5 tablespoons 3 is just too much! It’s really good! If you add paprika you have the Yum Yum sauce or Shrimp sauce as it is known is some areas. I made it 2 weeks ago and I’m making it again 🙂 Easy and delicious!! This was amazing! So easy to make and everyone loved it. Thank you so much! Do you have a favorite brand of butter and low sodium soy sauce? Plz let me know. Thank you! I forgot to give it 5 stars! out delicious. My husband kept saying how good it was. Thank you for a tasty recipe and easy too ???? You’re very welcome Genny – glad you liked it ! Hi, this recipe sounds great. I want to try it, but I was wondering which brand of soy sauce you recommend? Not sure which one to get. I added about a tablespoon extra of oil because it didn’t look like it was going to be enough but 2 was a little too much. I think that’s why it came out more greasy instead of dry like the pro fried rice. It’s missing one flavor and I think that’s going to be Yum sauce. Other than that it’s almost spot on with the best fried rice I’ve ever had. I’m going to add a little more soy too cause the rice should come out a little more brown. 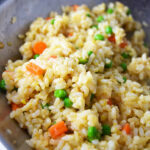 A recommendation that made the recipe a little more like hibachi restaurant fried rice. I used calrose rice instead of instant rice. It’ll make it less dry. I also add some yum yum sauce and a little poke. We made this tonight and it was so good, thank you for posting. 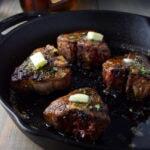 I love this recipe and it’s super simple. My 17 yr old picky daughter LOVES it! I’ve made several times. Thanks for providing! This was delicious!!! My rice was mushy though. I made the rice in the morning and refrigerated. Should I have left it out or cooked before making the rice and just let it cool? Hmm, I’m surprised because usually the fridge will slightly dry out the rice. Not sure why that happened to you. Maybe the rice was slightly overdone.